According to the American Cancer Society, 1 in 8 women in the U.S. will develop invasive breast cancer during their lifetime. One out of every 36 women in the U.S. will die from breast cancer. These rates have dropped since the 1960s, a fact attributed to increased awareness, regular screening and improved treatment methods. Regular screening, such as mammograms, leads to earlier detection of breast cancer, when treatment is more likely to be successful. As successful as regular mammograms are, mammography may miss early-stage small cancers. This is particularly an issue for women with denser breasts. 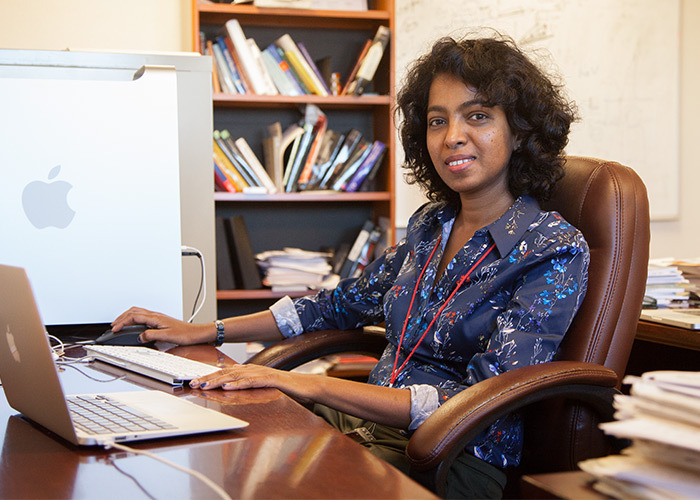 Mini Das, assistant professor of physics in the College of Natural Sciences and Mathematics at the University of Houston, was awarded a highly competitive $1 million Breakthrough Award Level 2 grant from the Breast Cancer Research Program, administered by the Department of Defense. This three-year grant was one of only 15 awarded for 2016. Mini Das, assistant professor of physics, received a $1 million Breakthrough Award Level 2 grant from the Breast Cancer Research Program, administered by the Department of Defense.The grant supports Das’ research to develop an innovative imaging technique to solve the problem of low tissue contrast in current breast cancer imaging techniques. To do this, Das will lead an interdisciplinary team of physicists, biologists and engineers. “A contrast mechanism that measures the refraction of X-rays, rather than the absorption, offers the potential to improve tumor detection without the need to rely on high X-ray absorption to generate a signal,” said Das, who holds a joint appointment in UH’s Department of Biomedical Engineering. Conventional mammograms work by producing short bursts of X-rays that pass through the breast. Different tissue types absorb differing amounts of X-rays. The detector, which measures the intensity of X-rays, creates a shadow image, with varying shades of white and gray indicating different tissues. A tumor will have its own unique X-ray absorption rate, appearing on the image as slightly distinct from the surrounding tissues. However, in women with dense breast tissue, tumors are not as easily detected because dense tissue absorbs X-rays at a rate similar to t.
Das is working on a new imaging method that will detect how X-rays bend, a property called refraction. This technique has the potential to provide a higher amount of contrast between differing tissue types, which can solve the challenge of differentiating dense breast tissue from tumors and aid early detection. This new contrast mechanism, called "X-ray phase contrast,” holds significant potential for dose reduction, improved soft tissue contrast, and better quantitation and discrimination in in-vivo imaging. Detecting the bending of X-rays is challenging as they bend by a relatively small angle. Also, X-rays passing through tissues are both bending and being absorbed in tissues, a double effect that complicates the quantitation and interpretation of results. “To measure the bending of X-rays, we need methods that can extract this information from the intensity measurements,” Das said. Similar to light, X-rays come in different wavelengths, with the wavelengths having different energies. The detectors currently used in mammograms are very limited in that they do not allow separation of X-rays by their wavelengths or energy. The limitations in imaging due to the existing detectors are analogous to being limited by black and white photography rather than color photography. Das’ research will use the Medipix3 detector, which has the capability of detecting the different wavelengths in X-rays. This new capability for “color imaging,” along with the advanced algorithms and physics models developed by Das’ research team, should allow a practical solution to extract quantitatively accurate X-ray phase contrast images. The Medipix detectors were originally developed for the Large Hadron Collider experiments at CERN, the European Union for Nuclear Research. UH’s membership in the Medipix collaboration was made possible through the efforts of Lawrence Pinsky, the John and Rebecca Moores Professor of Physics. “Researchers have spent the last 20 years trying to find a practical solution for measuring the refraction of X-rays with quantitative accuracy,” Das said. “Existing methods use significant approximations or clinically impractical instrumentations.” She believes that, with the use of the new color X-ray detectors and additional strategies developed by her team, she has the key to making this work in a practical application such as clinical breast imaging. “Our proposed methods will allow us to collect all the information with just a single step. That is the key to making this practical,” Das said. Das will create a bench-top prototype, physics models and advanced algorithms which she will test by imaging breast tissue samples. Das’ work will be in collaboration with Pinsky, Daniel Frigo, UH assistant professor of biology and biochemistry, and clinical consultants from M.D. Anderson Cancer Center.